Hitmen in GTA Vice City Stories. Hitmen are hired guns that appear in Grand Theft Auto: Liberty City Stories, and Grand Theft Auto: Vice City Stories. In GTA Liberty City Stories they appear in the mission No Son of Mine, where they are hired by Toni's mother to kill her son, Toni Cipriani. However they just end up getting killed by Toni. From that point on they continue to attack Toni at random moments up until the mission Making Toni. They are depicted wearing dark suits, with gloves, and five o' clock shadow. 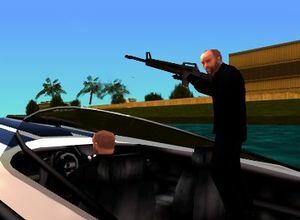 In GTA Vice City Stories they first appear in the mission Soldier where they murder Jerry's drug contact, and possibly attempt to take out Victor also. Later in the storyline they are hired by Giorgio Forelli, to attack Barry Mickelthwaite and Phil Collins, as seen in Kill Phil: Part 2. They have the same appearance as they did in GTA Liberty City Stories. After In the Air Tonight, Barry decides to pay off his debt, not to take the risk of Phil being killed. Vehicles in GTA Liberty City Stories are Mules, Esperantos, Perennials, and Landstalkers. And in GTA Vice City Stories they are seen only with the Violator. Weapons include Mac-10s, Mirco SMGs, TEC-9s, AK-47s, Pistols, and M16s. Every protagonist (besides Victor Vance) is at one point in their lives, a hitman. Niko Bellic is the most hired hitman of all protagonists. Toni Cipriani killing hitmen during No Son of Mine in GTA Liberty City Stories. This page was last modified on 4 April 2013, at 23:19.